What is not challenged in the postcolonial scenario are the institutions, discourses, and traditional oppressive power structures inherited from colonialism. In the case of Pakistan, these include landlordship, feudalism, Pirism, an elite and aloof bureaucracy, the schism between town and country, sectarianism of all kinds, and other obscurantist traditions and customs. The experience of US power in Pakistan has been to continue to strengthen oppressive structures of power that work against the people and keep them wallowing in fatalism and obscurantism. Let me start by telling you about the lives of two ordinary Pakistanis, David Barkat and Parsa. David, 55, lives with other Christians in a kachi abadi (slum) in Lahore, where he migrated in 1991 to make a living. He sells oranges and peanuts in the winter and ice in the summer, working from 6 am to 8 pm. If he has a good day, he makes around 130 rupees (about $2). From this income he has to support his family and keep up with bills, food, and other necessities. To give an idea of the difficulty involved, the going rate for 12 bananas in the market is 60 rupees. None of David’s three children have had any formal education: “I cannot even dream of getting my children educated,” he says. They have had to work from a young age to help the family survive. David survives by his own ingenuity and the assistance of his community. He relies on an informal support network for interest-free loans and other help. Parsa is 25 years old, a widow without children, and has two brothers and three sisters. She works as a prostitute. Parsa lives in a small hut on the outskirts of Lahore. The hut has a bed, a floor sheet, two blankets, one cassette player, one jug, three glasses, and one torch. She gets up each day at around 11:30 am and has breakfast before heading to work at 4 pm. When she reaches Taxili brothel, she gets herself ready by putting on clean clothes and makeup. She pays 200 rupees per day to the manager at the brothel for these “amenities.” She then goes to Data Darbar and other locations in the area to look for customers. She charges 100 rupees per customer and takes them to a hotel room for which she pays a monthly rent. She takes Sundays off and though she has no fixed schedule, she manages to eat three times a day. She is not happy with her work and tells me, “I am tired of this work and my desire is to get married to a nice person who treats me with respect.” Many things have changed for David and Parsa over the years, but for the most part they have not been touched by the US “War on Terror.” The money sent by the US (and more than $13 billion has been sent since this perpetual war began) has not changed their lives, nor was it meant to. Education, housing, jobs, and capital ownership have not been provided. David and Parsa are part of that wretched (by design of structure of power) and dignified 50 percent of Pakistanis that live below the poverty line and live by ingenuity and shared toil, a daily solidarity. Empires and international aid do not and cannot solve the problems of ordinary Pakistanis. What then has this money and this “War on Terror” done? The invasion of Afghanistan required Pakistani assistance. The US needed, at the very least, logistical routes in Pakistan to supply its war efforts in Afghanistan. Under Musharraf, a dictator who came into power in 1999, the Pakistani Army negotiated a deal giving it $9 billion in military aid over the next eight years. 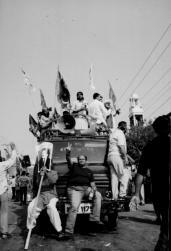 This has had a number of deleterious effects for ordinary Pakistanis, the most obvious being the strengthening of the military apparatus and power structures and with it, what can be called a logic of violence. This is not to mention the military’s use of its power in usurping resources to build and run sugar mills, petrol pumps, cereal mills, and shopping malls, among other economic activities. Further, echoing the reasoning of the “War on Terror,” the military adopted a similar logic of violence for internal issues. Legitimate claims by the population, instead of being addressed, have been answered by brute violence. This is illustrated by the fighting in the northern areas of Pakistan, but also by the Baloch insurgency. On August 26, 2006, after several attempts on his life in the preceding months, Nawab Bugti was murdered along with many of his tribesmen. Bugti, though a relic of past generations of feudal society, nonetheless argued that the people of Balochistan were being unfairly treated by the federal government. Indeed, there was, and still is, cause for resentment. The Sui Gas company, which supplies 35 to 40 percent of Pakistan’s gas needs and is the single biggest factor in its industrialization, was expropriated from Balochistan without the province receiving a fair return. Gas supply to Baloch cities and villages did not arrive until 1986 (in Quetta only) and then only because the military had set up a garrison in the area. Further, the Baloch province receives only 12.5 percent of the royalties from the Sui Gas project, and Balochistan remains Pakistan’s least industrialized province despite aiding industrialization in the rest of the country. The expropriation of copper and gold from Balochistan is also being carried out without due return to the Baloch people. The contract was given to a Chinese firm that takes 75 percent of the profits generated. The federal government receives 23 percent, leaving the remaining 2 percent for the Baloch people. The Baloch people and their leaders have a legitimate grievance, but first Musharraf and now the Pakistan People’s Party (PPP) regime blocks any process which might lead to the resolution of this exploitative situation. Instead, a vicious violence is their answer—aimed at eliminating leaders and disappearing all dissenting voices. The haunting case of the “missing people” in Pakistan should be seen in this context. This has been another practice adapted from the logic of the US and the “War on Terror,” and Baloch nationalists are the largest group in the list of missing people. Some claim that as many as 12,000 people are missing. Petitions for 517 missing persons have been filed with the Supreme Court of Pakistan. Most are thought to have been abducted by Pakistani intelligence agencies and held illegally in secret prisons where they are subject to torture. The missing persons cases illustrate the role of the national bourgeoisie as an intermediary. The Pakistani military and bourgeoisie have not only opened up Pakistan for logistical support to NATO forces in Afghanistan, allowing drones to shower down missiles on parts of northern Pakistan (for a handsome commission), they have also sold their citizens. The US Reward for Justice program is authorized to give multi-million dollar rewards globally for information that prevents “terrorism against US interests worldwide or leads to the arrest or conviction in any country of an individual for the commission of such an act.” The important point to note is that money is not given upon successful conviction but merely upon arrest. Most of the prisoners that are captured, tortured, and rendered to Guantanamo Bay have come by way of Pakistan. Pakistani intermediaries have been handsomely rewarded. The case of Binyam Mohamed is illustrative. Binyam, a British resident who, having recently converted to Islam, decided to travel through Muslim lands and was picked up in 2002 at the Karachi airport, where he had gone for his return flight to Britain. Pakistani intelligence officers held him in Karachi where they tortured him as intermediaries for the British spy agency MI5. Binyam told his lawyers that before being questioned by MI5, he had been hung from leather straps, beaten, and threatened with a firearm by Pakistani intelligence officers. He was later rendered to Morocco, Afghanistan, and Guantánamo Bay before being released without charge, after six and a half years. Rangzieb Ahmeh, another British resident captured in Pakistan, had three of his fingernails pulled out by the Pakistani intelligence agency (ISI) during interrogations. Again, it was Pakistanis who did the torturing while the British asked the questions. The national elite, playing its role of business agent and intermediary, has not been able to transform the country from its colonial setup nor actively provide justice to its citizens. However, it is not only the military but also feudal structures that have strengthened their hold as a direct consequence of the US “War on Terror.” By 2007, Musharraf and the military had become a liability for the United States. The people had begun to raise their voices and organize under the lawyers’ movement. An election and parliament in Pakistan—if managed probably would further consolidate American power. And so we move to the election of 2008, the victory of the Pakistan People’s Party (PPP), the passing of the Kerry-Lugar Bill (promising a further $7.5 billion over five years), and further elite alignment with US power. Pakistan’s parliament is almost exclusively controlled by members of the national elite. Parliamentarians of the PPP are generally from feudal backgrounds. Their wealth comes from inherited land and from the families of serfs that live and toil on this land. Wealth is created by this pool of serfs—cheap and sometimes bonded labor—and sustained in luxury by the owning class and their offspring (most of whom are idle or involved in politics). Owners dominate their local circles politically, economically, and socially and use this power to keep serfs uneducated and outside non-feudal structures (i.e. government structures and laws), thus sustaining their pool of cheap labor, as well as their own status and profits. These profits are spent, in almost all cases, on Western luxury goods (including education), political campaigning, and Japanese Jeeps. Given the lack of proportional representation in the electoral system and the vast inequality of power in each district between feudal landlords and the rest, it is almost always the case that elections flood parliament with landlords. The current Pakistani Prime Minister (Syed Yousaf Raza Gilani), President (Zardari), and Foreign Minister (Makhdoom Shah Mehmood Qureshi) are all examples of this phenomenon. The establishment of democratic practices, institutions for the people, and a commitment to social justice are antithetical to the interests of the national elite. The effect of US power in Pakistan has been to further strengthen the tyranny of the elite. It has done nothing for Parsa or David or for the 50 percent of the population lying in misery, in serfdom, in controlled exclusion, or in daily terror of starvation and death. In this sense, it is not a War on Terror but a war on Pakistanis. Qalandar Bux Memon is a lecturer in Politics at Foreman Christian College, Lahore. Memon is Editor of Naked Punch magazine and co-founder of Café Bol, a cultural café in Lahore. He is also a worker with the Labour Party of Pakistan.